Have you ever been in an emergency situation and froze? Being unable to remember simple information such as you or your kids birthday or even your street address is normal in an emergency situation which is one of the many reasons Smart911 was created. I have been using Smart911 for 3 years, and each year the system automatically emails me to make sure they have the most up-to-date information for my household. Smart911 is a free service used by public safety agencies across the country to enhance communication and response for their community. It can be used by 9-1-1 agencies to quickly send first responders to the location of an emergency with more information, or by emergency management to better plan for and respond to disasters, and by municipalities to send emergency notifications to their citizens. 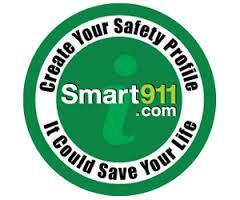 The Safety Profile you create when you sign up for Smart911 is completely private and only shared with 9-1-1 when you call from a registered landline or cell phone. You can provide individual family members names, photos, birth dates and physical descriptions, medical conditions, medications, allergies and rescue notes and physical or developmental disabilities an individual may have. You can also include your primary language in case a translator may be needed and utility information which lets fire crews know where a gas or electric shut off valve is located during a fire or weather emergency which can help avoid additional accidents. Have pets? Include them in your profile as well! It takes only a few minutes to fill out your profile which can save valuable seconds in the event of an emergency. For more information, or to create your profile, click here.